If you’ve seen a few too many fight flicks, International Boxing and Fitness doesn’t have the grit you might expect from a neighborhood gym. But walk inside the facility and you’ll notice immaculate walls and floors completely clean of the blood, sweat and tears long associated with the cruelest sport. A sign at the front door warns members not to cuss when children are present. The importance of the rule was readily apparent on Wednesday afternoon as children of various ages poured into the facility. It’s clear that IBF has the community in mind, and thus, was a perfect stop on the HBO Boxing Training Truck’s community outreach efforts. Leading up to Daniel Jacobs’ April 28th fight against Maciej Sulecki at Brooklyn’s Barclays Center (on HBO World Championship Boxing at 10 PM ET/PT), HBO and HBO Latino kicked off a week of family-friendly events to celebrate Jacobs’ return to the borough. The Training Truck, decked out with decals of Jacobs’ steely pose, shuttled between schools, recreational centers, gyms, and the Barclays Center. The truck stopped at IBF in Ridgewood to give the kids in attendance, aged eight to 16, an introduction to a boxer’s workout while promoting healthy habits along the way. One of those habits is good conditioning: Kids were handed brand new jump ropes and asked to complete as many reps as possible. Some of the kids (and their parents) were recruited by the truck’s stops beforehand. 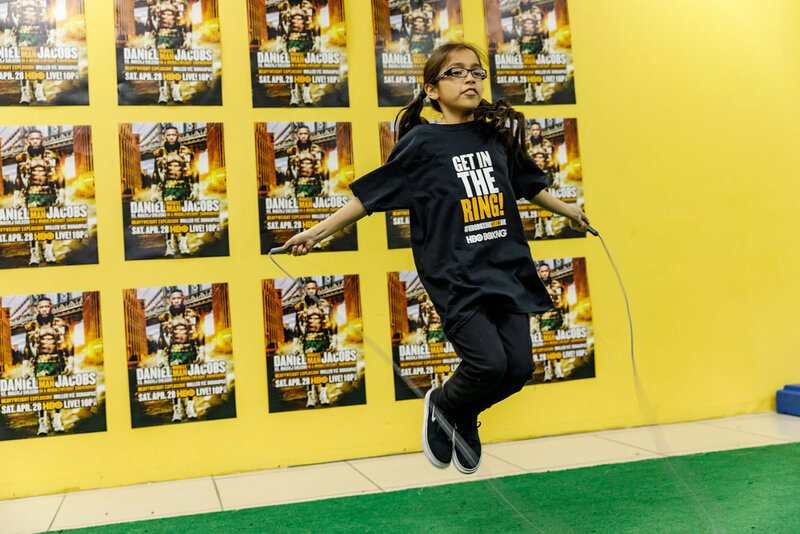 For many, it was their first time handling a jump rope, let alone stepping inside a boxing gym. Other children that joined the event were regulars at the gym and quite literally “knew the ropes.” Still, both sets of kids were equally excited by the challenge of mastering their timing and form. The trainers then moved on to drills teaching proper punching form and footwork. The kids fed off the enthusiasm of the supportive volunteers and staff, who provided simple instructions to improve their mechanics and encouraging words to remind them that they would improve with every jab, cross and dodge they performed. IBF founder Victor Cruz prides himself on the gym’s service to children. “This is a family business. We love to be around the kids,” Cruz told Inside HBO Boxing. He added that his plan was to spend the rest of his life (he just turned 81) helping the children succeed in his gym. When it was time to raffle off a surprise gift for the children in attendance, young Jacob’s confidence was on full display. Of the dozens of kids in attendance, he happened to pick winning ticket: seats at the Jacobs vs. Sulecki fight. After the initial rush of excitement of hearing his name announced, Jacob ran to his mother, hugged her, and shouted, “I knew it! I knew I’d win.” On Saturday night, his confidence will have carried him all the way to Barclays.